Achieve Your Florida Roofing Contractor License Today! Get a Florida Roofing Contractor License Today! Pass the exam and get your license. In the state of Florida, all roofing contractors must be licensed in order to perform services for hire. Obtaining a Florida roofing contractor’s license entails passing your licensing exam and meeting the experience requirements. Gold Coast School of Construction is dedicated to providing you with the knowledge and guidance needed to get your roofing contractor’s license. If you have any questions about how to obtain your license, contact our helpful Career Counselors at 1-800-732-9140. We are happy to assist. The Gold Coast School of Construction is the leader in construction education for both Registered County and State Certified roofing contractors. Students enroll with Gold Coast because they have one goal, to pass the licensing exam! Our curriculum, methods, and team of experienced instructors are dedicated to helping every student achieve that goal. We understand that anyone can claim to be the best school in Florida, but we can prove it. We understand that the details of how to get your license can be overwhelming. The information found here will help answer many of your questions, but please contact our helpful Career Counselors at 1-800-732-9140 if you have any questions. We are here for you every step of the way! Experience does not have to be gained in Florida or even the USA so long as it can be verified and notarized by a State Certified Florida Licensed Roofing Contractor with an equal to or higher certification. Becoming a licensed Roofing Contractor in the state of Florida requires passing a two part licensing exam. Part 1: Trade Knowledge and Part 2: Business and Finance. 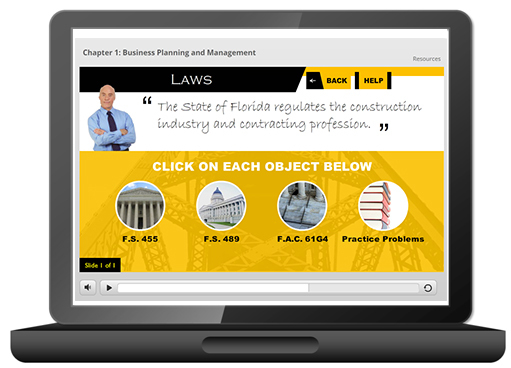 Gold Coast’s classroom based exam prep program is structured to help you pass both parts. Classroom instruction focusing on the Business and Finance portion of the state licensing exam. Students are welcome to attend as many of these sessions as they would like for up to one year. A targeted lesson will be presented each evening. Bring your questions and we will show you how to work through to the answers together. Your tuition is valid for one year allowing you to take as many classes as you would like during this period. The online contractor exam prep course is designed to enable you to prepare to pass the Roofing Contractor exam with the convenience of online learning. This online program is designed to bring the classroom experience into your computer or tablet while enabling you to study at your own pace. This course combines the best of classroom education with the flexibility of self paced online learning and live instructor webinars. Remember, the state licensing exam is open book and contains two parts. (Part 1) Roofing Trade Knowledge and (Part 2) Business and Finance. The online roofing prep program focuses on helping you pass both parts in order to get your license.